A moderate breeze and drizzle greeted players at the Argyll and Bute area stroke-play championship at Rothesay Golf Club. 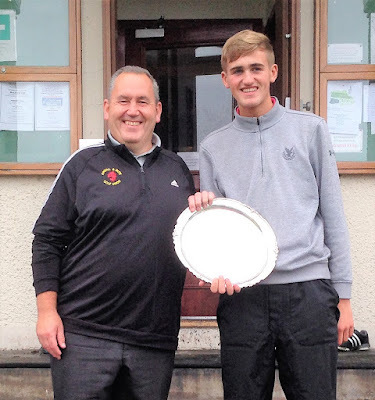 Despite the weather it was 16 year old Lachlan Reynolds who was last man standing as he won a remarkable four area titles by virtue of his four-hole play-off victory over Graham Bolton. In addition to the area championship title he secured victories by winning the youths, boys and Under-16s crowns as well . Lachlan's total of 139 ( 72-67), one over par, separated him and Graham by two shots from the rest of the field. In third place was ex -champion Craig Pirie with Donald Standaloft one shot further back. In the team trophy Rothesay secured victory by pipping holders Millport by virtue of better third score and will represent Argyll and Bute in the Scottish Club Championship at Kinross in September. Pictured is winner Lachlan Reynolds with Area Executive member Ian Shaw. The Area Executive would like to thank Rothesay Golf Club for hosting the event and for the greenkeeping staff in presenting the course in first class condition. We would also like to thank Captain Willie Glen for his assistance in organising the event.